The Northeast Florida Beach communities are flourishing. For those data-driven people looking at homes for sale in Jacksonville Beach and nearby communities, this article will take a deep dive into the real estate numbers. The Median home sale price (homes for sale and condos for sale) is up +4.6% over last year. New listings are down -14.5% from last year, and there are only 3.9 months worth of supply. There were a total of 341 closed sales in the Jacksonville Beach real estate market in November, down -11% from last year. This indicates that it’s a good time for seller’s to list. There isn’t much competition, and the overall market is rising. Because there are a large number of condominiums in Jacksonville Beach, it’s interesting to look at this market in terms of single family homes and condominiums. The median sales price for a single family home for sale in Jacksonville Beach is actually up 6.1%, while the condo market saw a dip at -.1%. That dip is so tiny, you can say the condo market is pretty flat. 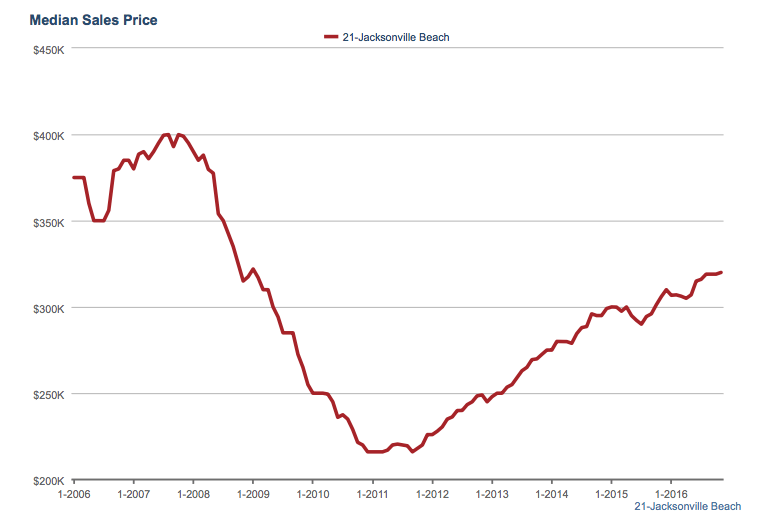 This was confusing to me though, as we’ve had some good condo sales in Jacksonville Beach this year. Turns out, it’s the lower end condo market, not the high end condo market, that is seeing the dip. Condos for sale in the Jacksonville Beach market in the under $500,000 range saw a decrease in median closed sales price of -4%, while the $500,000+ range saw an increase in a median sales price of +20%. The lower priced condos for sale in Jacksonville Beach have a relatively low supply of 3.5 months, while the higher end ranged condos have an 8.9 month supply. And if you haven’t already guessed, there is a significantly larger number of sub $500,000 condos sold in Jacksonville Beach annually, with 207 closed sales vs the $500,000+ market that only saw 57 closed sales. What does it mean for buyers? If you look at the graph above, you can see the market is certainly climbing up from the lows of 2011, but it’s not yet back to the peaks we saw in 2007. Prices will continue to rise, so it’s still a good time to get in. For sellers, it all depends on what kind of property you have. What about neighboring Neptune Beach? The real estate market in Neptune Beach looks a little different than Jacksonville Beach. Maybe it’s the slightly homier, cozy feel and the flourishing town center, but the numbers show a faster growing market. The median home sale price is up +9.6% over the last year. That is well above the national average which is reported to be up +6%. 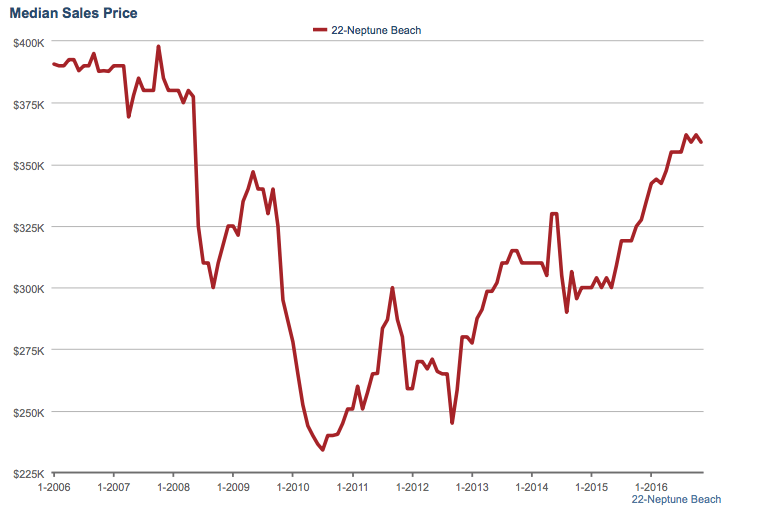 There is a median of 3.6 months of supply, indicating a seller’s market in Neptune Beach, with a median list to sold ratio of around 97%. Buyers, don’t expect a huge discount off of list prices if the home is priced at fair market value (FMV). The Neptune Beach numbers are even more interesting if you look at them from an east of A1A vs a west of A1A perspective. The median home sale price east of A1A was up a whopping +14.6% compared to home sales west of A1A which are up +7.5%. Price per foot is somewhat of a useless number when looking at property close to the ocean, as there are so many nuances. But, people always want to know, so here it is. There is a huge delta between the price per foot in east Neptune at $297 per foot vs west Neptune at $186 per foot. With the new Lucky’s (health focused grocery) opening and other stores likely looking to develop around it, west Neptune could be a great place to buy if you don’t mind a short bike ride to the ocean. And any homes for sale in Neptune Beach on the east side of A1A are going to do well. There is only so much land left, right? 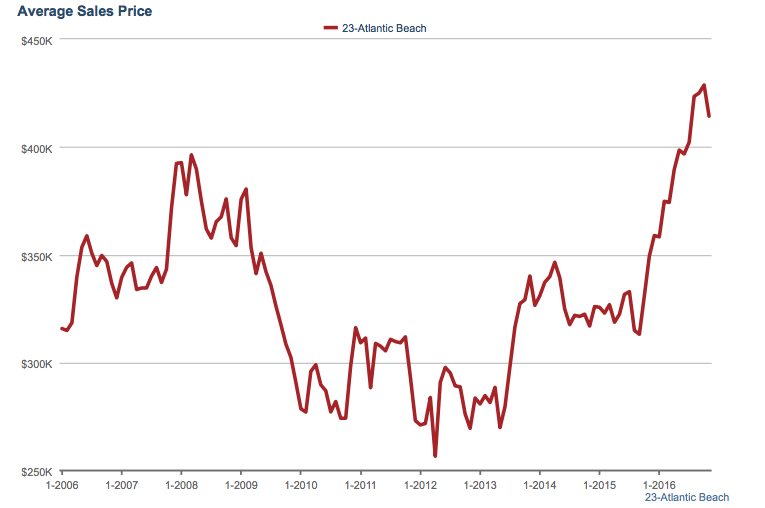 The median sales price in Atlantic Beach is up a startling +18.6%, and there is a 4.4 month supply of homes for sale in Atlantic Beach. Prices are up and there isn’t much inventory! If you look at the graph below you’ll see that 2016 brought in significantly higher numbers than the the bubble years. Atlantic Beach Beach real estate is definitely another area where you need to analyze the market via east vs. west, otherwise the numbers don’t make sense. The median home sale price for east Atlantic Beach was $559,290 for November, which is up +20.1% over last year, while west Atlantic Beach saw a median homes sale price of $162,454 which is up +22.7%. East Atlantic Beach’s numbers can be attributed to the new Atlantic Beach Country Club, which has brought in a slew of new homes for sale at a higher price point. And, old Atlantic Beach has some gorgeous properties within walking distance to the beach that will forever be a premium. Here’s a look at recent closed home sales for Atlantic Beach. West Atlantic Beach contains a lot of properties off of Mayport Road. Expect to see more of those properties being flipped and the area gentrified over the next few years. Note: All data pulled straight from the Northeast Florida MLS. Gwinn Volen is the creator of the Ponte Vedra Focus blog, and a real estate agent at Ponte Vedra Club Realty. She works with agent Jayne Young.